February seems to be getting the better of me. I can't believe we're a full week in already! I am making a quilt for my next door neighbors. I've been planning it since about New Year's Day, but I learned two weeks ago that they are moving, so that moved my timeline up a little. It's a simple pattern using all dog fabrics. I don't have any photos yet, but the top is pieced and I'm working on getting it quilted. Finishing the quilt for my neighbors is my February OMG (one monthly goal) in the motivational link up hosted by Patty of Elm Street Quilts. As for other February projects, I'd like to finish 2 Project Linus quilts from my pile and get caught up on my RSC blocks. I'm not sure I'll have the time to accomplish much beyond that in this short month. The pile of donation tops. Sounds like a wonderful gift for a friend. Thanks for linking up with Elm Street Quilts One Monthly Goal and good luck on your project. Sounds like you have plenty to keep you busy this month. Stay healthy! Good Luck with your goals Emily. Looks like you have some fun fabrics in your donation tops. All doggy fabrics sounds like it will be a super cute quilt! 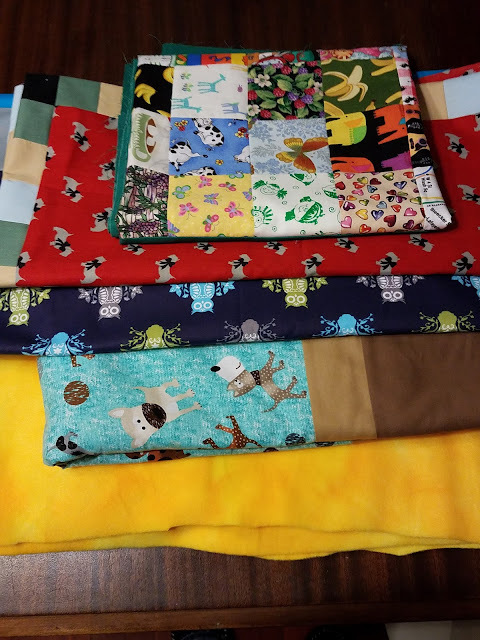 I see a few pups peeking out of your donation pile :) Lots of darling novelty fabrics in there! Good luck with your OMG. It's amazing how fast this month is going!